Robert Ian Perina was born January 16, 1921 in Irvington. A swift, smart and rock-solid six-footer for Newark Academy in the late-1930s, he excelled on the football field and in the classroom. The star of several teams with the Minutemen, Bob was hailed as one of the area’s best all-around athletes—a reputation he maintained after enrolling at Princeton in 1939. He was a daring runner, tremendous passer and accurate kicker. Following an impressive freshman year, Bob joined Ted Weiman’s varsity in 1940 and won the starting halfback job in 1941. In the Tigers’ offense—which was traditionally built around a “triple threat” back—this made Bob the team’s primary passer. He developed a great rapport with his receivers, usually hitting them in stride and on the numbers. Bob had a fine season but the team went just 3–5–1. Wieman was let go after the campaign. Bob enlisted in the Marines after graduating in 1943. He was part of the Iwo Jima invasion and was wounded during battle. He received a Purple Heart and Bronze Star for heroism. After the war, Bob was among the returning veterans wooed by the newly formed All America Football Conference. He signed with the “hometown” New York Yankees, joining a powerhouse backfield that included Spec Sanders, Ace Parker and Frank Sinkwich. The Yanks rolled to the division title with a 10–3–1 record but lost to the Browns in the AAFC championship game, 14–9. Bob was the team’s primary punt returner as well as a starting defensive back, running back, and passer. In 1947, Bob filled the same roles for the Brooklyn Dodgers, who finished 3–10–1. Given his understanding of passing schemes, Bob was an unusually good defensive back in the pros. 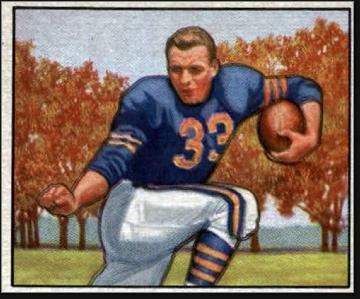 He intercepted 18 passes in 53 games, including 6 in 1948 with the Chicago Rockets and 6 more with the NFL Chicago Bears in 1949. Bob played one more season in the pros, in 1950 with the Baltimore Colts. The defense was horrible and he decided to retire after one game. In the era before football salaries could provide a year-round income, Bob spent the off-season working in a radio and TV dealership. In 1951, after leaving the game, he enrolled in the University of Wisconsin School of Law. He passed the bar in 1953 and worked as a deputy district attorney in Madison before going into private practice for 25-plus years. Bob retired in 1988 and passed away in 1991, in Madison. Bob’s granddaughter, Emily Perina, was a cross-country runner for Wisconsin who earned Academic All-America Honors.